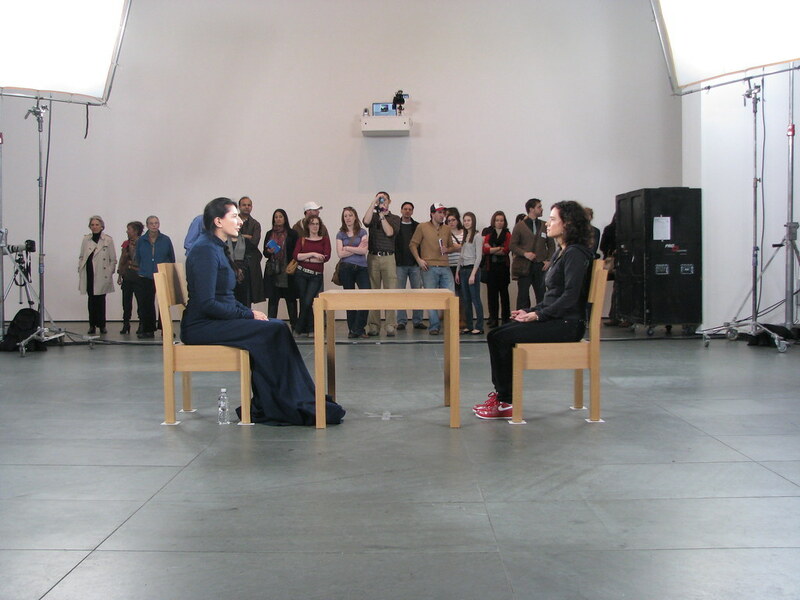 See my take on what it was like to stare down Marina Abramovic at MoMA over at WNYC. Plus, find a photo essay of the guy who sat in front of Abramovic for seven hours at A Flower Every Day. (Whoa.) The show is up through May 31. Photos by C-M, with the assistance of Priya Alvarez. (Gracias, P!!!) Place the cursor over images for captions. I happen to be in the Balkans now. Isn’t that interesting. The experience of interconnection remains, that place(?) where senses are present but sort of inactive, mainly looking, attention traveling from inside to outside, hanging out in that undefinable border of perception where it is no longer me, but neither the other. Thanks C-M for the cosmic minute of coincidence & the rescue operation. 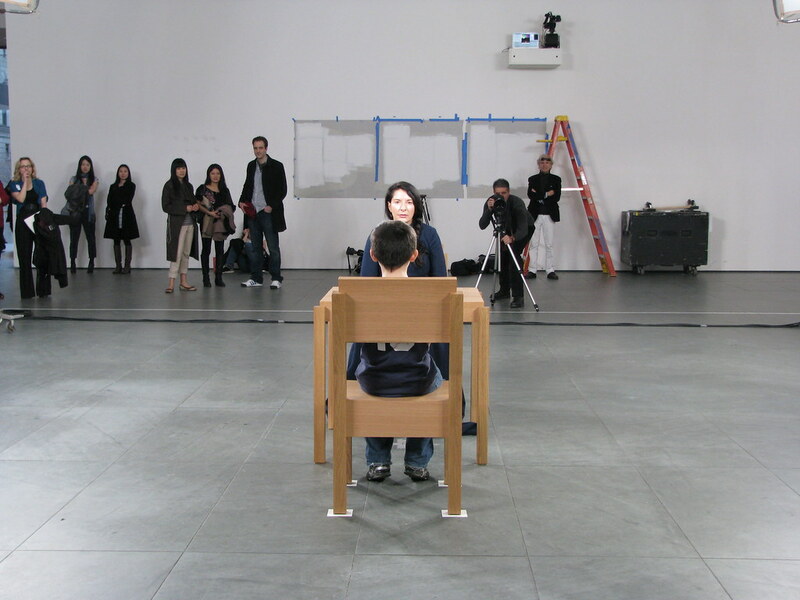 Silent human art indeed, before, during, after. Thanks for the post. Loved this exhibit and will be going back. 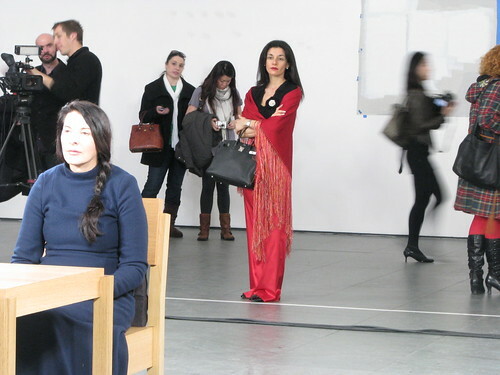 Wondering if anyone has done anything but sit and stare at Marina. Those seem to be the unspoken rules but what about reading to her, talking to her etc. Wondering if anyone has stretched the “rules” yet…. @aaron: the sign as you approach her invites viewers to “sit in silence.” i suppose you could sit there and not look at her and not be violating the rules. but i have a feeling that if you started to speak, you’d probably get kicked out. i have to confess, i woulda been waaaaay too intimidated to try any shenanigans. i got really nervous when my turn came… not sure why. (i’m not one that gets my nerves rattled too easily.) 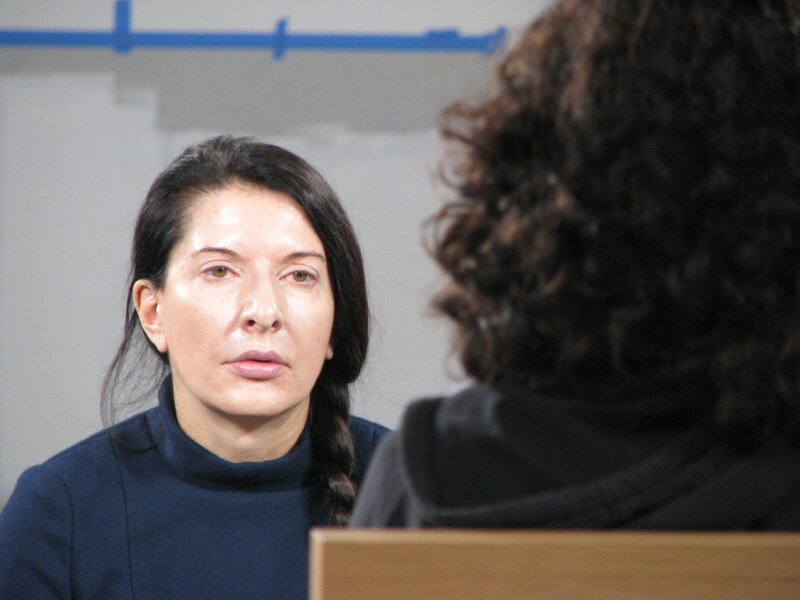 i may not love much of abramovic’s art, but the woman has a PRESENCE. and yes, it kinda scared me. 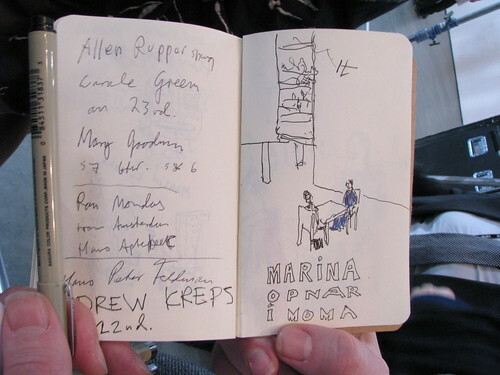 @carolina: tried to synchronize breath while gazing as you suggested in yoga @class but found hers to be almost imperceptible, connection strong nonetheless, lovely images here & thx 4 the mention. btw, i can only imagine the sort of hostility that guy drew for staying there for seven hours. that line is vicious! exactly what I was thinking about hogging the Marina. 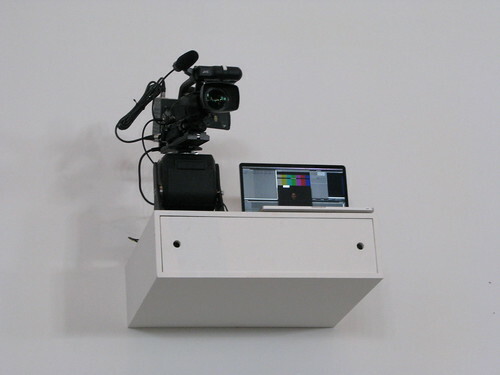 I’ve been watching the Marina-cam somewhat obsessively, and it’s seemed like a mix of the curious/experiencers and practitioners of some kind. 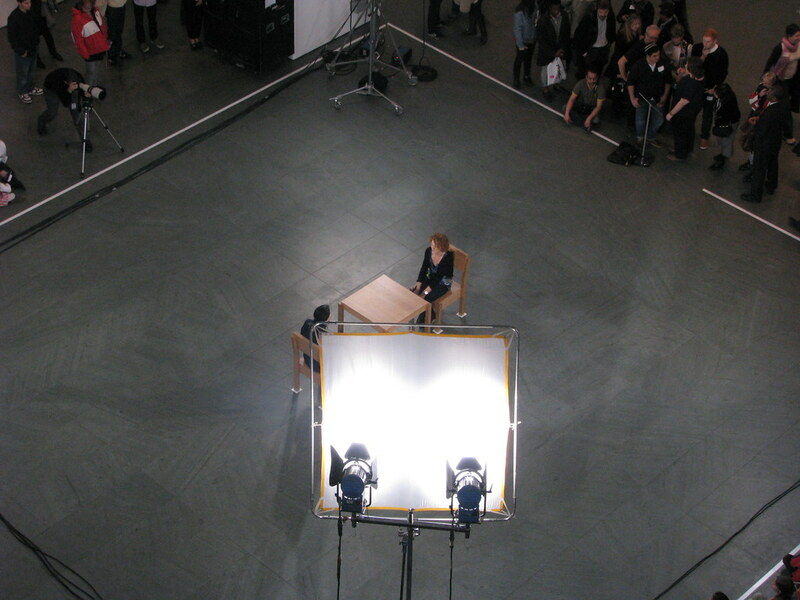 She quickly becomes a canvas or a platform for other peoples’ projections and personalities. I’ve managed to see two transitions, too, and was blown away. As soon as someone leaves, Abramovic shudders and collapses. That’s her point to rest/reset, which means that when someone’s in front of her, she is “on.” which is exhausting to even think about. (he’s the one who cracked her up) along with singing, asking her to marry him and performing outside MOMA all in one day. guess i have to find my inner red dress! So many interesting characters in your photos. I got to agree with ‘peoplmovr’, how did you miss Amir Baradaran? 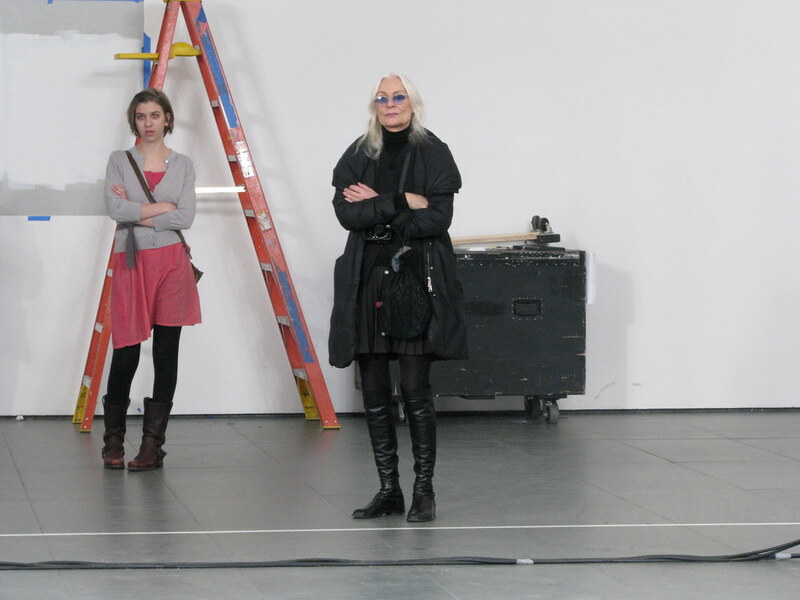 It is crazy to see the public’s reaction to performance work- especially when the public is full of artists as well. 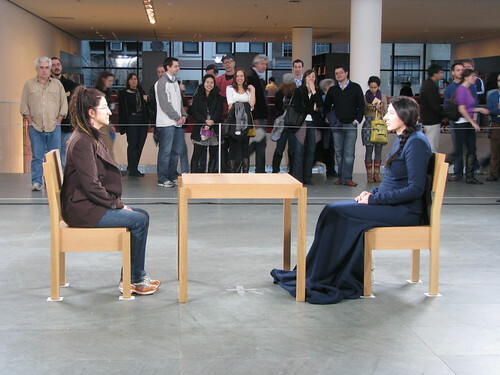 Someone should try to make Abramovic lose her composure and laugh. You know, like what some people try to do with the Buckingham Palace Guards? It would be much more fun that way! Hoolie they did manage to make her laugh! See a few posts up. Reminds me of the staring competitions we used to have at school. Great concept.